Wine Bottle Gift Tote Bag - a blue swirl background features a crescent moon and stars, purple and yellow stripes form a bottom border. Has a yellow "rope" handle. 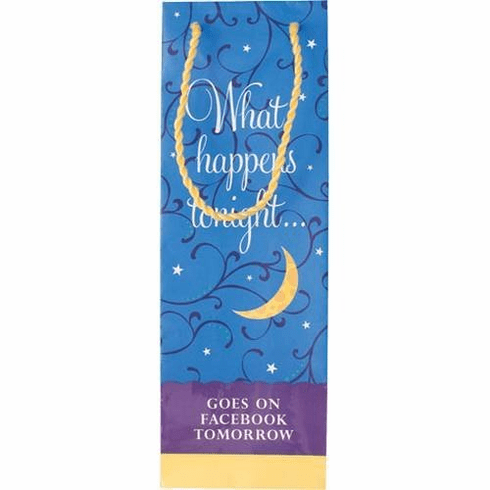 Perfect accessory for a Bachelorette party or Girl's Night Out! Pair with coordinating wine bottle stopper, napkins and a can "koozie" for a great gift! Measures approximately 4 3/4"W x 3 1/2"D x 14"H. Message: "What happens tonight... goes on Facebook tomorrow".